This Post has already been read 536 times. 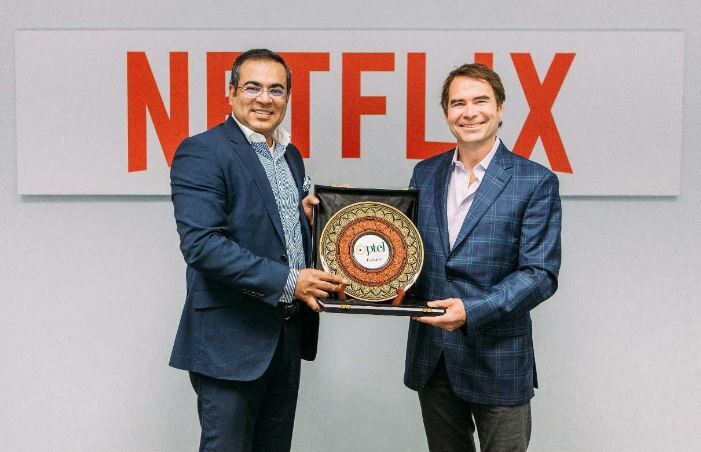 Pakistan Telecommunication Company Limited (PTCL) has inked an agreement with Netflix, the world’s leading online entertainment company, to provide Netflix Gift subscriptions for 6 months to PTCL’s 8 Mbps and above internet subscribers. PTCL is the first telecom operator in Pakistan to launch a partnership with Netflix. Chief Commercial Officer PTCL, Adnan Shahid, met with Netflix’s Global Head of Business Development Bill Holmes at Mobile World Congress in Barcelona, where details of the agreement were discussed. PTCL already hosts advanced caching servers for Netflix in Pakistan for better viewing experience. Both companies have been offering Netflix content to PTCL customers since last year as a trial. Seeing the excellent results and traction from customers, PTCL has now ventured into this agreement for enabling quality entertainment content for the consumers in Pakistan. Under this agreement, PTCL 8 Mbps and above internet subscribers are able to redeem up to 6 months of unlimited access to premium Netflix content, enabling them to catch their favorite on-demand TV shows, movies, original Netflix critically acclaimed content and more on their smartphones, tablets, smart TVs and gaming consoles etc. Furthermore, PTCL will provide its customers the ease of paying for their Netflix subscription through PTCL’s monthly consolidated billing, instead of payment through credit cards. PTCL subscribers can now stream to their heart’s content with their truly unlimited broadband plans to enjoy a sublime, buffer-free Netflix experience.